The standard row width for potato production in the Columbia Basin of Washington and Oregon is 86 cm (34 in. ), but the reasons for this are unclear. The goal of this research was to identify a row width that maximizes potato grower revenue by optimizing land use efficiency. A 2012 pilot study conducted in central WA with four potato varieties (Alturas, Ranger Russet (R.), R. Burbank, and Umatilla R.) and four row width treatments (76, 81, 86, and 91 cm (30, 32, 34, and 36 in.)) indicated that row widths <86 cm had several advantages over those ≥86 cm. The protocol and methods were refined and a larger study conducted between 2013 and 2015. Russet Norkotah, Chieftain, and Teton R. were planted with the four varieties mentioned above into 71, 76, 81, and 86 cm (28, 30, 32, and 34 in.) row-width treatments; in-row seed piece spacing was 25.4 cm (10 in.). When data were averaged across years and varieties, a quadratic regression provided the best fit for total yield and adjusted gross return; the values for each peaked at 79 cm and 80 cm, respectively. Row widths of 76 and 81 cm produced 6 and 7 t ha−1 higher yields, respectively, than the 86 cm industry standard. The 81 cm treatment produced 7.3% higher adjusted gross than the industry standard. Compared to the industry standard, plants from the 71 cm rows performed poorly; this 15 cm (6 in.) reduction in row width caused a 9.3% loss of adjusted gross income. Tuber weight and number per plant and were maximized when rows were ≥81 cm wide. These data suggest that the industry standard row width of 86 cm is an inefficient use of land and that an inter-row spacing of 80–81 cm (31.5–32.0 in.) could improve economic return to Columbia Basin growers by as much as $937 ha−1. La amplitud estandar entre surcos para la producción de papas en la rivera del Columbia de Washington y Oregon es de 86 cm (34 pulgadas), pero las razones para esto no están claras. La meta de esta investigación fue de identificar una distancia entre surcos que maximizara la ganancia del productor mediante la optimización del uso eficiente de la tierra. Un estudio piloto en el 2012 conducido en el centro de WA con cuatro variedades de papa (Alturas, Ranger Russet (R.), R. Burbank y Umatilla R.) y cuatro tratamientos de distancia entres surcos (76, 81, 86, y 91 cm (30, 32, 34 y 36 pulgadas) indicó que la distancia entre surcos <86 cm tuvo varias ventajas sobre aquellas de ≥ 86 cm. Se refinaron el protocolo y los métodos y un estudio más grande se condujo entre 2013 y 2015. Se plantaron Russet Norkotah, Chieftain, y Teton R. con las cuatro variedades ya mencionadas arriba, en tratamientos de distancias entre surcos de 71, 76, 81, y 86 cm (28, 30, 32, y 34 pulgadas), y espaciamientos entre las unidades de tubérculo-semilla de siembra de 25.4 cm (10 pulgadas) dentro del surco. Cuando se promediaron los datos entre años y variedades, una regresión cuadrática proporcionó el mejor ajuste para rendimiento total y ajustó la recuperación neta; los valores para cada uno alcanzaron su máximo a 79 cm y 80 cm, respectivamente. La amplitud entre surcos de 76 cm y 81 cm produjeron rendimientos de 6 y 7 t ha-1 mayores, respectivamente, que la de 86 cm estándar de la industria. El tratamiento de 81 cm produjo 7.3% más alto de recuperación neta ajustada que el estándar de la industria. En comparación con el esándar de la industria, las plantas de surcos a 71 cm se comportaron pobremente; esta reducción de 15 cm (6 pulgadas) entre surcos causó un 9.3% de pérdida ajustada del ingreso. El número y peso de tubérculo por planta se maximizaron cuando los surcos estuvieron a ≥ de 81 cm de amplitud. Estos datos sugieren que la distancia estándar entre surcos de la industria de 86 cm es un uso ineficiente del suelo, y que un espaciamiento entre surcos de 80–81 cm (31.5–32.0 pulgadas) pudiera mejorar la recuperación económica de los productores de la rivera del Columbia en tanto como $ 937 ha-1. Many considerations influence potato row width, including tradition, variety, harvest season, soil moisture-holding capacity, fertility, stoniness, available machinery, irrigation potential, yield, and costs of land, labor, and equipment (Stuart 1919, 1923; Sojka et al. 1988). During the early twentieth century, potatoes in Europe and Canada were grown in rows as close as 61 cm or less (Stuart 1923). In the eastern United States inter-row spacing was generally at least 76 cm and often as much as 91 cm - a distance well suited for horse-drawn planters (Sojka et al. 1988). In western dryland farming areas, relatively wide row widths were used (91 cm) due to limited moisture (Grubb and Guilford 1912; Stuart 1919, 1923). In 1925, the first commercially available mechanically-operated tractor was used in Pennsylvania to plant potatoes into 86 cm rows (Blasingame 1934). In a 1965 article, Kunkel indicated that the distance between rows in Washington varied between 81 and 91 cm and that 86 cm was common (Kunkel 1965). It is unclear whether he was suggesting that growers were planting at different row widths between 81 and 91 cm intentionally or that the 10 cm range was the result of imprecise return passes (guess rows) of potato planters, even though their drivers were targeting row widths of 86 cm. Only a handful of researchers have examined row width differences in the US (Houghland and Parker 1948; Kunkel 1965; Nelson 1967; Love et al. (1995); Mundy et al. 1999; Conley et al. 2001; King et al. 2011; Tarkalson et al. 2011). Four papers focused on the effects of conventional row systems vs. bed planting systems (Nelson 1967; Mundy et al. 1999; King et al. 2011; Tarkalson et al. 2011). Houghland and Parker (1948), Kunkel (1965), Love et al. 1995, and Conley et al. (2001) were the only researchers to directly compare one or more conventional row-width treatments to another, and Kunkel (1965) was the only one to conduct the row width research in Washington. In a one-year experiment on fertilizer rate, in-row spacing, and row width, Kunkel (1965) reported that row width had little to no effect on yield. He suggested that closer spacing within and between rows led to higher total and US No. 1 yields. However, his data on yields of 68.4, 69.6, 69.8, and 69.6 t ha−1 with row widths of 76, 81, 86, and 91 cm, respectively, do not show a tendency for closer spacing between rows to increase yields (Kunkel 1965). Moreover, Kunkel (1965) failed to calculate economic return to the grower. From an experiment conducted in the Columbia Basin of Washington, Pavek and Thornton (2006) concluded that there was little or no inter-row competition between potatoes planted into rows 86 cm apart. They arrived at this conclusion when plants in a row adjacent to a simulated planter skip failed to benefit from the gaps left by missing plants. There was no increase in total yield or gross return when the planter-skip neighbor row treatment was compared with the optimum-stand treatment (no skips). This lack of inter-row competition suggests that 86 cm row spacing was too wide to utilize the land efficiently and that decreasing row width below 86 cm may increase yield per unit area. In the Columbia Basin of Washington and Oregon, the current standard row width is 86 cm, and with the use of a GPS auto-steer sub-cm tractor, the guess row measurements are close or equal to 86 cm. Maximum yields from potato crops do not necessarily produce maximum profits (Bolding 2017). The goal of this study was to identify the row width that produces the highest grower return from seven popular potato varieties over multiple years when grown in the Columbia Basin near Othello, Washington. Specific objectives were to understand the effects of row width on potato tuber yield, quality, and size; number of tubers per plant, and grower returns and to demonstrate how input and land use efficiencies can be improved by increasing production on a given area of land without increasing the use of fertilizers and non-seed-treatment pesticides. A pilot study was conducted near Othello, WA in 2012 to determine the feasibility of studying potato row width in the Columbia Basin of Washington State. When this study began, 86 cm (34 in.) was the standard row width for the Columbia Basin region. The pilot study included four processing potato varieties commonly grown in the Pacific Northwest: Alturas, Ranger Russet (R.), R. Burbank, and Umatilla R., and four row widths 76, 81, 86, and 91 cm (30, 32, 34, and 36 in.). Potatoes were planted on April 25, vine-killed September 20, and harvested September 25. Because an appropriately adjustable planter was not available, the tubers were hand planted by placing seed pieces into furrows previously opened with shovels mounted on a tractor tool bar. Seed pieces were spaced 25.4 cm apart within rows. The furrows were closed using hilling discs mounted on a tractor tool bar. Final seed piece depth was approximately 20 cm. Following positive results, data from the pilot study were used to develop the row-width treatments listed below. Other than the materials and methods previously described, the 2012 materials and methods were similar to those described below. During 2013–15, seven potato varieties (Alturas, Chieftain, Ranger R., R. Burbank, R. Norkotah, Teton R., and Umatilla R.) were planted into four row-width treatments: 71, 76, 81, and 86 cm (28, 30, 32, and 34 in. ); trials were planted at the Washington State University Irrigated Research Farm near Othello, WA (46o 47.277’N. Lat., 119o 2.68’W. Long.) into a Shano Silt Loam soil (classified as Andic Mollic Camborthid (USDA 2008)). Planting dates during 2013–15 were April 24, April 12, and April 20, respectively; canopies/vines were killed 154, 151, and 150 days after planting (DAP), respectively; harvest dates were October 7, September 15, and September 23, respectively. The four-year crop rotation included wheat, peas, corn, and potatoes. Prior to planting each year, certified seed tubers of each variety were hand cut into 57–85 g seed pieces and suberized at 9o C and >95% relative humidity for 10–14 days. Treatments were planted into a split-plot design and replicated four times with variety as the main plot and row width as the sub-plot. Plots were five or six rows wide by 5.1 m long. Data were collected from the center row. Suberized seed pieces were planted with a row-width-adjustable, custom-built, two-row assist feed planter. Two tractors were used independently to pull the planter because tire track-width varied by treatment. One tractor had wheels spaced 172.7 cm apart to plant the 81 and 86 cm rows, the other had wheels spaced at 152.5 cm to plant the 71 and 76 cm rows. Tractor tire width was 28 cm. During 2013–14, the furrow locations (proper row width spacing) of the potato row width treatments were marked out prior to planting using a tractor-pulled toolbar with 6–8 mark-out shovels mounted on the toolbar via 76 cm shanks. The mark-out furrows guided tractor/planter tire placement. In 2015, the mark-out toolbar was not used. Instead, a GPS auto-steer tractor with sub-cm accuracy was used to guide the planter. Row width was adjusted as needed via the GPS steering system. Seed pieces were planted 20 cm deep (top of seed piece to top of hill) and 25.4 cm apart within each row. One plant of the purple-skinned potato variety All Blue marked the beginning and the end of each row and plot to separate plots and provide end plants with competition during growth. Each year, plots received approximately 400–250-450 kg ha−1 N, P2O5, and K2O, respectively (soil residual + applied) (Lang et al. 1999). All fertilizer was pre-plant broadcasted and incorporated 15–20 cm deep except for N. Approximately 100 kg ha−1 N was incorporated prior to planting. The remaining 300 kg ha−1 N was applied in increments of 20 to 40 kg ha−1 via irrigation water between 50 and 100 DAP. Pesticide and herbicide applications were consistent with commercial production practices within the Columbia Basin region. Furrows between each row were ripped approximately 30 cm deep with tillage shanks to alleviate compaction caused by planting. For most of the 2013–14 seasons, soil moisture for live and actively growing plants was kept between 65% and 85% plant-available soil moisture by monitoring border rows planted at the industry standard row width (86 cm, 34 in.) with a neutron probe and irrigating using a center pivot irrigation system. Due to a possible moisture deficit in the denser plant population treatments of 2014, soil moisture was monitored differently in 2015. To ensure treatments with the highest plant populations were receiving adequate water, random plots of high and low plant populations were monitored and the 2015 trial kept between 65% ̶ 85% available soil moisture for live and actively growing plants. The potato canopy was removed each year using a mechanical flail 5–14 days prior to harvest. In-season data categories measured for each variety and treatment included: full emergence stand-count and stem number, and vine length (2013 only), and plant senescence (percent of dead or dying canopy) ratings at 130 DAP. Maximum vine length (longest stem/vine) at 80 DAP was measured during 2013 from the third or fourth plant in the center row of each plot. Tubers were harvested using two custom-built one-row harvesters. One harvester had a blade width of 71 cm and was used to harvest the 71 and 76 cm rows; the other harvester, with a blade width of 81 cm, was used to harvest the 81 and 86 cm rows. The following post-harvest data were collected or calculated after each tuber was washed and weighed via a mechanical washer/sizer: tuber number per plant, average tuber weight, weight and number of US No. 1, No. 2, and cull tubers, tuber size profile in 28 g increments for each grade, specific gravity, internal physiological defects, and tuber bruising. Cull categories included malformations, growth cracks, knobs, greening, rot, and undersized tubers. A subsample of 10 tubers between 227 and 340 g was collected from each plot and used to calculate tuber specific gravity (weight in air/(weight in air – weight in water)) and percent incidence of blackspot and shatter bruise, brown center, hollow heart, and internal brown spot. In addition, tuber length-to-width ratio was measured. Base price value: $121 MT−1 for market grade (US No. 1 and 2 grade) tubers. Tubers > 170 g: penalties imposed of $0.91 MT−1 for each percentage point below 53% of total yield that were 170 g or heavier tubers; below 40%, lots were penalized $18.00 MT−1. Premiums for market grade tubers 170 g or greater of $0.73 MT−1 for each percentage point >53% of the total tuber yield composite, with premium maximum not to exceed a total of $11.00 MT1. US No. 1 clause: Penalties of $0.18 MT−1 for each percentage point the total yield contained below 60% US No. 1 tubers >170 g, with the total penalty maximum not to exceed $3.82 MT−1. Premiums for US No. 1 grade tubers 170 g or greater of $0.36 MT−1 for each percentage point >60% of the total tuber yield composite, with total premium maximum not to exceed $9.00 MT−1. Undersized clause: Market grade potatoes <113 g (process culls) valued at $54.55 MT−1. Specific Gravity clause: Premiums MT−1 were $0.91 for an average specific gravity of 1.078, $2.73 at 1.079, $4.55 at 1.080, $6.36 at 1.081, $7.27 at 1.082, $8.18 at 1.083, with a maximum of $9.09 for 1.084 through 1.088. Above 1.088 premiums were $8.18 at 1.089, $7.27 at 1.090, $6.36 at 1.091, $5.45 at 1.092, $4.55 at 1.093, $3.64 at 1.094, $2.73 at 1.095, $1.82 at 1.096, $0.91 at 1.097. No premium or penalty applied at 1.077, 1.098, or 1.099. Above 1.099, lots penalized $0.91 MT−1. Penalties MT−1 were $4.55 at 1.076, $9.90 at 1.075, and $13.64 at 1.074. Below 1.074, lots were penalized $18.18 MT−1. No penalties or premiums were applied for tuber fry color, internal physiological defects, or bruise. Gross return was calculated for R. Norkotah and Teton R. using Columbia Basin, WA, fresh market values for specific sizes of US No. 1 and No. 2 russet potatoes (Spear et al. 2017). Gross return for Chieftain was calculated using methods and prices described in Blauer et al. (2013) for specialty market red potatoes. Adjusted gross return for all varieties was calculated by subtracting the estimated increase in seed expense for each treatment (Table 1) from the gross value. Seed was valued at $364 MT−1 for cut, insecticide- and fungicide-treated and delivered seed pieces weighing an average of 85 g (Table 1). Reducing row width increased row number per square ha (Table 1); therefore, an increase in variable cost ha−1 was calculated and subtracted from the gross return to account for additional equipment usage or passes ha−1 with reduced row widths (Table 1). The variable cost calculation assumed the grower would use the same equipment configuration (number of rows planted, cultivated, harvested, etc.) upon switching to a narrower row width. Total yearly variable costs included labor, equipment maintenance, fuel, and depreciation and were valued at $506 ha−1 for 86 cm row width; the estimated increase in variable cost was assessed at $4.37 row−1 per sq. ha. Values were derived by using data from Hinman et al. (2006) and Galinato and Tozer (2015). A key objective of the reported research was to improve input and land use efficiencies by increasing production on a given area of land without increasing the application rate of fertilizers and non-seed treatment pesticides; therefore, no additional inputs were added beyond those used for the standard row-width treatment nor were non-seed associated input costs subtracted from the gross return because input level remained constant across all row width treatments. Final economic values were converted to a percentage of the standard row-width treatment value, 86 cm (except during the pilot study in 2012, when 91 cm was used as the base value), for each variety and treatment. Because the 2012 treatment structure and planting methods were different from those of the main trial, data from the pilot study were not combined with the 2013–15 data. To clarify the effects of row width changes on gross return, a hypothetical adjusted gross return was calculated under the assumption that economic value per plant remained the same, regardless of row width. The hypothetical adjusted gross return was calculated by multiplying an estimated value per plant ($0.15) by the number of seed pieces required to plant one ha at each row width and subtracting the seed and variable cost ha−1 associated with each row width (Table 1). The economic values were converted to a percentage of the standard row-width (86 cm) cost and regressed across row width. Data were analyzed as a split-plot design (variety = main plot, row width = subplot) using ANOVA, and means separated using Fisher’s Protected Least Significant Difference Test at the 0.01 and 0.05 levels of probability. When year-to-year treatment effects were similar, the data were combined across years for analysis. Important interactions among the main factors were partitioned and are discussed. Significance levels and trend lines (linear or polynomial, e.g. quadratic) are reported where appropriate. Plant emergence was >95% each year for all varieties and treatments (data not shown). As row width decreased, plant population increased (Table 1). The potato canopies of the narrower row width treatments appeared to achieve 100% groundcover earlier in the season than those of the wider rows, as expected, because plants in narrower rows had less inter-row space to cover than those in wider rows. Moreover, vine length increased in response to row width reductions, possibly due to enhanced plant competition from inter-row neighbors (Fig. 1). Row width did not affect stem number per plant, plant senescence, tuber length-to-width ratio, tuber bruising, or internal and external tuber defects, therefore, the data are not shown. Varieties in the 2012 pilot study had similar responses to the row-width treatments; therefore, yield and adjusted gross return values for 2012 were averaged across varieties (Fig. 2). A quadratic regression showed increases in yield and adjusted gross return as rows were planted closer together than the industry standard row width treatment (86 cm) and the 91 cm treatment. When row width was reduced to 76 cm, adjusted gross return increased by 20% and yield increased more than 10 t ha−1 above that of the standard row width (Fig. 2). Planting rows farther apart than 86 cm appeared to be relatively unprofitable. Because only row widths below the industry standard of 86 cm substantially increased yield and economic returns, the 91 cm treatment was removed and a new series of row width treatments (71, 76, 81, and 86 cm) was used in the 2013–15 seasons. Analysis of total yield and adjusted gross from 2013–15 resulted in a significant year-by-treatment interaction for five of the seven varieties, Alturas, Ranger R., R. Burbank, R. Norkotah, and Umatilla R.; the data are therefore shown by year and averaged across these varieties. In 2013 and 2015 responses to the row-width treatments were similar. In 2013 (Fig. 3, top), the quadratic curve for total yield peaked at 78 cm inter-row spacing, while adjusted gross peaked at a row width of 79 cm, which was 17% higher than the adjusted gross of the standard row width (86 cm). Adjusted gross in 2015 also peaked at 79 cm with a value 10% higher than that of the standard row width (Fig. 3, bottom). Row width had only a slight effect on 2015 total yield (Fig. 3, bottom). The pattern of the treatment response in 2014 was different from 2013 and 2015. Total yields of the 81 and 86 cm treatments were similar, but declined as row width was reduced (Fig. 3, middle). Adjusted gross for 2014 was highest at the 86 cm row width and declined steadily as row width narrowed. During 2014, the lowest adjusted gross was produced at the narrowest row width, which produced 20% less adjusted gross than that which resulted from the 86 cm row width. Cultural management during the 2014 season was reviewed in an effort to separate a treatment response from a management issue. During 2013–14, irrigation was monitored only with the 86 cm treatments. Neutron probe soil moisture data (data not shown) from 2014 indicated that available soil moisture was kept near the bottom of the target range (65% to 85% plant-available soil moisture (ASM)) during much of June and July, a critical growth stage for production of canopy that will continue to translocate energy to tubers in August and September. It is possible that the denser plant populations within the 71, 76, and 81 cm treatments developed higher water demand than the industry standard row width, especially prior to 100% groundcover, and that growth was compromised for these treatments in 2014. This concern was remedied in 2015 by monitoring random plots with high and low plant populations and maintaining soil moisture at levels >65% ASM within the trial. It is also possible that soil nutrient levels were inadequate in 2014 as plant density increased in row widths <86 cm. To explore durability across time for each row-width treatment, total yield and adjusted gross return were averaged across 2013–15 for each variety (Fig. 4) and across all varieties (Fig. 4, lower right; Table 2). The treatment responses for each variety were best described by quadratic functions (Fig. 4). Total yield and adjusted gross for all varieties peaked on or between the 76 and 81 cm treatments when averaged across years. The predicted adjusted gross peaked at row widths at or between 80 to 81 cm for Ranger Russet, Russet Burbank, Umatilla Russet, and Russet Norkotah. The adjusted gross at the peak for each of these varieties was between 5% and 9% higher than that of the industry standard row width. The predicted adjusted gross for Alturas, Chieftain, and Teton Russet peaked at or between 77 or 79 cm row widths and was 10–11% higher than that of the industry standard row width. The adjusted gross for the 71 cm row width was typically lower than that of the 86 cm row width for all varieties except Alturas and Chieftain, where the values of gross returns with row widths of 71 cm were similar to or slightly higher than the returns with row widths of 86 cm (Fig. 4). When data were averaged across varieties and years, total yield was lowest for the narrowest row-width treatment, 71 cm (Table 2, Fig. 4, lower right). Row widths of 76 and 81 cm produced up to 6 and 7 t ha−1 more yield, respectively, than the industry standard. Moreover, the 81 cm treatment produced 7.3% more adjusted gross than the industry standard (Table 2). The adjusted gross averages of the 76 cm treatment and the 81 cm treatment were not significantly different from each other. Adjusted gross income with the 81 cm treatment was significantly higher than the industry standard of 86 cm row widths, but adjusted gross from rows planted 76 cm apart did not differ from the industry standard (Table 2). Compared to the industry standard, plants from the 71 cm rows performed poorly; the 15 cm reduction in row width caused a 9.3% loss of adjusted gross (Table 2). Higher yields and ideal tuber size distributions were the primary causes of higher adjusted gross returns for the best performing row widths. In addition to low yield, the 71 cm treatment also had a poor tuber size profile and low tuber grades compared with the other treatments. The 71 cm treatment produced 4% fewer US No. 1 tubers, 5% fewer french fry tubers, 3% more undersized tubers, 2% fewer large tubers, and 2.4% more green tubers than the 81 cm treatment (Table 2). There were no significant differences in grade and size profile parameters with the 76, 81, and 86 cm treatments. As a percent of total yield, the fewest green tubers were found with the 81 and 86 cm treatments (Table 2). Green tuber production almost doubled as rows were reduced from 86 to 71 cm. As row width was reduced, the hills/ridges of the row-centers narrowed relative to wider rows. Perhaps expanding tubers from the 71 cm rows lacked adequate soil coverage compared to those from the 86 cm rows. Specific gravity increased linearly from the 86 cm treatment to the 71 cm treatment. This might indicate that the higher plant populations used more soil moisture throughout the year and that dryer soils near season end resulted in tubers with reduced water content at harvest. It also may be related to a lack of nutrients, like nitrogen, at the higher plant populations. The average tuber weight increased as rows were planted more than 71 cm apart, and average tuber weight per plant increased when row width increased from 76 to 81 cm (Table 3). Plants from rows that were 81 or 86 cm apart did not differ significantly in tuber weight, weight of tubers per plant, or number of tubers per plant. The data suggest neighbor row plants lacked significant inter-row plant competition when plants were ≥81 cm apart. Potato row width research is relatively uncommon. The difficulties of conducting this research include the need for sophisticated adjustable equipment and the labor and time necessary to make timely adjustments. If the equipment is not easy to adjust, researchers must rely on multiple tractors, planters, cultivators, and harvesters. In addition, the data collection row must be surrounded with enough rows to mimic plant competition in a large commercial field. Replication of treatments requires up to twenty rows (5 × 4 reps) for each row width. For four row widths, 80 rows are required. Results from the 2012 pilot study provided evidence that row widths narrower than the industry standard of 86 cm may be feasible in the Columbia Basin. Both 76 and 81 cm treatments produced higher economic return than 86 cm wide rows, while the 91 cm treatment appeared to be too widely spaced. It was evident from three additional years of research that in most years the ideal row width for the investigated varieties was between 76 and 81 cm. Predicted grower return peaked at 80 cm when averaged across all varieties and years (2013–15). It is important to note, however, that during one of four years (2014) the industry standard of 86 cm performed better economically than all other treatments for five of the seven varieties. This may have been due to a lack of soil moisture or nutrients in the high plant density treatments (71, 76, and 81 cm row widths). One difficulty in conducting small plot research is ensuring that no treatments are over- or under-irrigated. As plant populations increase, water demand per hectare may increase compared to a smaller population (Friedman 2016). During 2013 and 2014, the treatments were irrigated using the methods used to irrigate the rest of the field which contained close to 7 ha of potato research trials with 86 cm-wide rows. Poor performance of certain varieties at the higher plant densities, particularly during 2014, and higher specific gravity may have resulted from insufficient available soil moisture during all or part of the season. During 2015, the soil moisture of the narrowest and widest treatments (71 and 86 cm, respectively) was monitored throughout the year. Using a standard irrigation program based on evapotranspiration replacement for the 86 cm row width, soil moisture appeared adequate for both treatments, never excessively wet or dry. During that year, the 81 cm row width was economically superior to the 86 cm treatment across the same varieties that performed poorly during 2014. Because the fertilizer rates were identical across all row width treatments, poor performance in 2014 from row widths below 86 cm could have also been due to a depletion in soil nutrients at the higher plant densities. One objective of the reported research was to improve input and land use efficiencies by increasing production on a given area of land without increasing the application rate of fertilizers. In years similar to 2014, it is possible that the addition of fertilizer to the higher density treatments may result in a higher yield, however, the economic return would be reduced by the cost of the additional fertilizer. The authors believe many growers in the Columbia Basin of Washington already apply excessive fertilizer and that a reduction in row width for these growers would be especially feasible. Options to enhance yield and economic return via means other than altering row width were considered. Throughout the trial, in-row spacing was held constant at 25.4 cm. Plant population with this in-row spacing and the industry standard row width of 86 cm was 45,588 plants ha−1. The plant population for the most economically advantageous treatment, 81 cm, was 48,438 plants ha−1. The plant population of the industry standard, 86 cm, could have been increased to match that of the 81 cm treatment by reducing in-row spacing to 23.9 cm; however, published (Bolding 2017) and unpublished multi-year research conducted on the same research farm with Russet Burbank, Ranger Russet, Premier Russet, and Clearwater Russet indicated that in-row spacings below 25.4 cm could result in a less favorable tuber profile and relative economic loss. It is plausible, however, that some varieties would benefit from in-row spacings <25.4 cm or from a reduction in both row width and in-row spacing. Different combinations of row width, in-row spacing, and planting style (bed vs rows) may also produce additional options for growers. The industry would benefit from additional research attempting to identify the ideal spatial arrangements and planting styles for all important varieties and regions. Our data on tuber number and average weight per plant averaged across years and varieties suggests that inter-row plant competition did not become significant until plants were grown in rows less than 81 cm apart. Plants that received the 71 cm or 76 cm treatments had lower tuber number and yield per plant relative to the wider row-width treatments. Because there was no apparent effect of inter-row plant competition on plant yield and tuber size profile with the 81 and 86 cm treatments, the treatment with the most plants ha−1 produced the highest seed-cost adjusted gross return. As plant density increases, interplant competition for water, nutrients, sunlight, and space increases. Potatoes may see a decrease in stem and tuber number per plant and average tuber weight (Knowles and Knowles 2016). The opposite effect is typically seen as potato plants are spread out. Plants from wider rows intercept less radiation than those from narrower rows due insufficient canopy size relative to the area of production (Opoku-Ameyaw and Harris 2001). To better understand the results of this study and the effect of plant competition on the economics of each row-width treatment, a hypothetical adjusted gross return was calculated and compared to the observed three-year average (Fig. 5). The hypothetical adjusted gross return assumed there was no treatment effect on plant competition due to density. If yield and tuber size profile per plant remained the same, regardless of row width, the adjusted gross across row-width treatments would be linear after seed and variable costs were removed (Fig. 5). As a result, the treatment with the most plants would produce the most income. Hypothetically, the 71 cm treatment would produce close to 16% more adjusted gross than the 86 cm treatment, if inter-row plant competition was not a factor. Moreover, the 81 cm hypothetical treatment would produce almost 6% more adjusted gross than the 86 cm treatment; this value is similar to the observed three-year average adjusted gross return (7.3%) of the 81 cm treatment when compared to the industry standard row width. Observed average values for yield, tuber size profile, and adjusted gross return of each plant from the 81 cm treatment were similar to those from the 86 cm treatment; however, the 81 cm treatment produced these results using 6.2% less land with the same level of management and production inputs. Planting potatoes into an area with rows spaced 86 cm apart appears to be an inefficient use of land, inputs, and solar radiation in the Columbia Basin. This research indicates that potato growers in the Columbia Basin would benefit by planting potatoes in rows narrower than 86 cm. Alturas, Chieftain, and Teton R. performed best planted into rows spaced 76–79 cm apart. Adjusted gross return values for Ranger R., R. Burbank, R. Norkotah, and Umatilla R. peaked at 80 or 81 cm when averaged across three years. If growers wish to plant a range of varieties and/or the industry wants to standardize the row width, rows 80 to 81 cm wide should work well for most varieties. A row width reduction of 5 or 6 cm (~2 in.) from the industry standard of 86 cm should not affect inter-row plant competition in the Columbia Basin; it should, however, boost grower net return by up to 7.3% ha−1. Equipment changes may require large capital investments; therefore, growers interested in row-width changes are encouraged to experiment where possible with row-width changes prior to purchasing equipment. Moreover, the expenses associated with changing equipment can be reduced if existing equipment is depreciated across its useful life prior to new purchases. Another concern for growers may be tractor tire width relative to traction requirements. A reduction in row width may require narrower tires and the resulting traction may be insufficient. Options for addressing this problem include adding additional tires to the front and rear (dual sets) and using slightly smaller equipment, windrowers, or self-propelled harvesters with rear inset tires. Another option for growers may be to leave the tire-track rows at 86 cm and reduce only the row widths between tires. With this option, however, growers will not be able to achieve the land use efficiency that results from spacing all rows the same (< 86 cm). Acres planted to potatoes totaled 68,800 ha in Washington State during 2017 (USDA-NASS 2017). Assuming an average yield of 70.6 t ha−1 and a gross return of $12,840 ha−1 (Galinato and Tozer 2015) from potatoes planted into 86 cm rows, growers could see a net revenue increase as high as $937 ha−1 (7.3%) by reducing their row width to 81 cm, provided any equipment conversion costs had previously been absorbed. This would result in a net increase of $47,400 per typical 50.6 ha (125 ac) center-pivot field. If only 50% of Washington State growers switched to 81 cm rows and experienced the same 7.3% gain ha−1, yearly industry profits may increase by as much as $32.2 M.
The Columbia Basin has a growing season >150 days long. The results from this study may not apply to regions with shorter growing seasons and/or lack of full-season irrigation. Research in other regions on row-width spacing that optimizes grower returns and land use efficiency while minimizing inputs would be worthwhile. We thank the Washington State Potato Commission, Northwest Potato Consortium, and the USDA’s/Washington State Dept. of Agriculture’s Specialty Crop Block Grant Program for partial funding of this research and Raul Garza Jr., Josue Rodriguez, Kathryn Bolding, Chandler Dolezal, and Seth Shelton for their contributions throughout this project. Tarkalson, D.D., B.A. King, D.L. Bjorneberg, and J.P. Taberna Jr. 2011. Evaluation of in-row plant spacing and planting configuration for three irrigated potato cultivars. 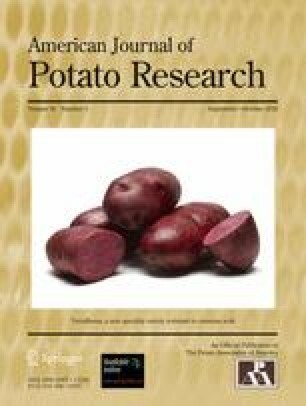 American Journal of Potato Research 88:207–217. doi: https://doi.org/10.1007/s12230-010-9185-9. USDA (Natural Resources Conservation Service). 2008. Web Site for Official Soil Series Descriptions and Series Classification, Shano Series. https://soilseries.sc.egov.usda.gov/OSD_Docs/S/SHANO.html.